Born in Mexico City. His father and his older brother (Miguel Covarrubias) were interested in painting as well as archeology and folk arts. Luis published and illustrated books about folk art, native costumes and dances. He painted murals, sometimes together with his brother Miguel. 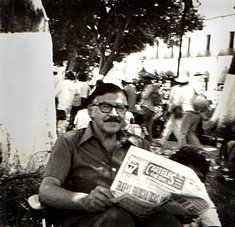 His collection of paintings entitled 'magic time' was exhibited at the Museum of Modern Art in Mexico (1974) with much success.